If you hike into the former site of Parkhurst on Green Lake today, you will find a few falling-down log cabins, and some rusted pieces of machinery that barely hint at its past as a booming logging community. There are also some more recent relics, including a once-white corvette with red leather seats, left behind by those that squatted at the site in the 1970s. In November, Sarah Drewery, the Museum Collection Manager, interviewed Norm Barr, whose parents owned Parkhurst Mill from 1926-1930 and then stayed on to manage it until 1938. Although he was born in 1932, and was just six years old when they moved on to Brackendale, he was able to provide some interesting pieces of information to help fill out the story of the mill and settlement at Parkhurst. 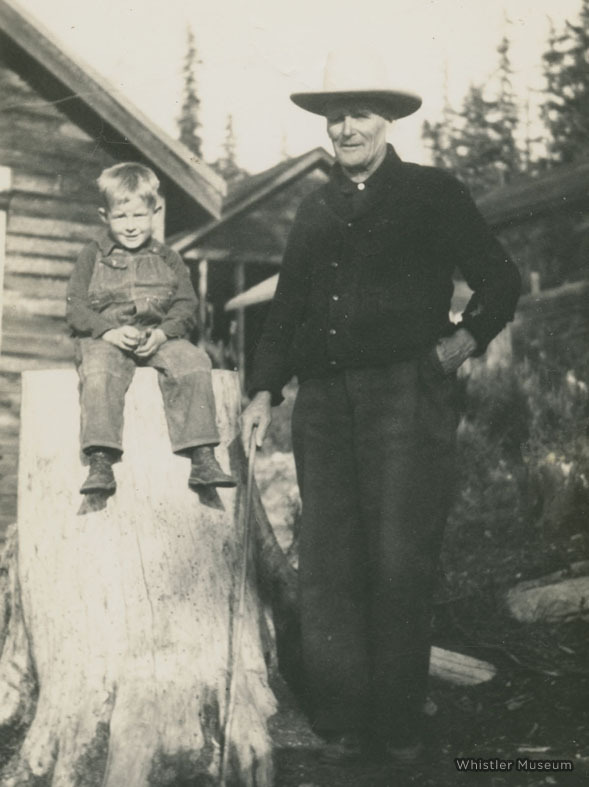 Alison and Ross Barr were married in 1923, and lived in Mission, where Ross and his brothers William and Malcolm were running the Barr Brothers’ Logging Company. When they ran out of available timber, they began looking for suitable property elsewhere. Initially, they went to Vancouver Island, but ultimately found there was more potential in the area around Green Lake. As luck would have it, there was a prime piece of land available right on Green Lake – the property had a point jutting out into the water, making it a perfect location for a steam-operated mill. This land belonged to the Parkhursts, who pre-empted the property in 1902. When Mr. Parkhurst passed away, Mrs. Parkhurst put it up for sale, along with the small log house they had built on the point. In 1926, it was purchased by the Barrs, who got to work building a mill and a camp for workers (including both bunkhouses and a few family homes). When the mill opened, they named it after the former landowners. It had three crews, with the total number of workers fluctuating between 60 and 70. Due to the snow, the mill had to close from two to five months of the year, resulting in seasonal work for the crews. Workers came from Vancouver and elsewhere, but most stayed only temporarily. Logging operation at Parkhurst, late 1920s. This photograph shows a railcar, a spar tree and the steam donkey. The man standing on a log in the foreground is Ross Barr. The Barr’s Parkhurst Mill was a very successful business, shipping lumber as far away as Ontario, Quebec and Nova Scotia. However, when the Great Depression hit, the price of lumber plummeted, making it impossible to cover the cost of transport. In 1930, the business went into receivership. According to Norm, the receiver hired Ross and Alison to remain on as watchmen while he worked to get the property sold. They were able to stay living in the house, but all they got for their work was $50 a month and a barrel of coal oil to burn for their lamps. They were the only ones that stayed. All of the crew members left immediately, hoping to secure other work at a time when jobs were extremely scarce. As for the Barr brothers, Malcolm had met an unfortunate end in 1928 when he fell off of the boat they used to pull logs around into Green Lake and drowned. William moved to Vancouver when the business went under, worked some odd jobs, and got married. In 1932, the operation was sold to Byron Smith and B.C. Keeley, and it was renamed Northern Mills. The Barrs remained on as managers of the thriving company until a spectacular fire burnt the mill to the ground in June of 1938. Although the mill was rebuilt and eventually reopened, the Barrs had moved south to Squamish by November of that year. 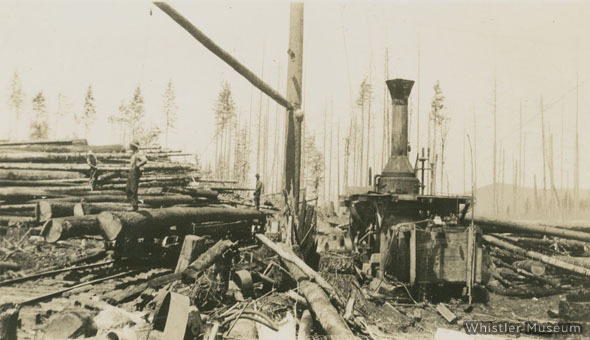 Immediately following the fire, what remained of the mill itself was moved to a site at the north end of Lost Lake. This was a somewhat shortsighted maneuver, and after 1939 it was moved back to Parkhurst, since the location next to the railway was significantly more convenient. The new mill was as big as the original one, and the settlement grew with more family homes added, a small store, and eventually a school. The mill operated until the 1950s. If you want to get a glimpse of the past, we recommend paddling a canoe across Green Lake and spending some time exploring – while you’re there, imagine what it was like when the mill was operational. For more details on the later years of the mill, see the article “Family Life at Parkhurst Mill” here. This entry was posted in Pioneers and tagged logging, parkhurst, pioneer, Whistler Museum, Whistorical, Whistory. Bookmark the permalink. Stayed there in 1970 with 5 or 6 Americcan draft dodgers… John and June I remember. Them and a few Canuk hippies.. they all planned to stay the winter and I helped them chop some wood… don’t know how they managed with all the snow and green wood to burn! I left before the winter.. sure was a nice place to be though. Bernie.